A life-sized, 82-foot blue whale art installation sculpture was on display in winter 2018 in Crissy Field, San Francisco. Made from discarded plastic collected in California, the sculpture raises awareness about plastic pollution threatening our oceans. Every nine minutes, 300,000 pounds of plastic and trash end up in the ocean -- the approximate weight of a full-grown blue whale. 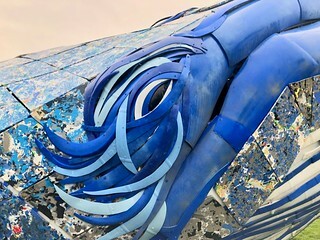 The blue whale art installation helps visualize this impact. This art art installation is presented by Monterey Bay Aquarium in partnership with the Golden Gate National Recreation Area (GGNRA), the Golden Gate National Parks Conservancy, Hub Strategy & Communication, Building 180, and lead artists Joel Dean Stockdill and Yustina Salnikova as a part of the Art in the Parks program.